is a fable about rats that invade Congress and astonishingly trigger a peoples’ political revolt. It starts when a Congressional reporter breaks a strange and shocking story: “Rats have invaded the toilet bowls” of both the Speaker of the House and the Minority Leader. The mighty rat invasions spark a national news frenzy. Activists seize on the burgeoning story to organize for a populist agenda. Millions of postcards are sent to Congress. Spontaneous rallies break out everywhere. The activists see the rats upending “business as usual” routines on Capitol Hill as a powerful symbol against the lobbyists and their corporate Congress. Order 5 copies of the paperback. or order via check from CSRL Books. Prices include shipping and handling. The rats, rising from the Congressional catacombs, have shown the way! 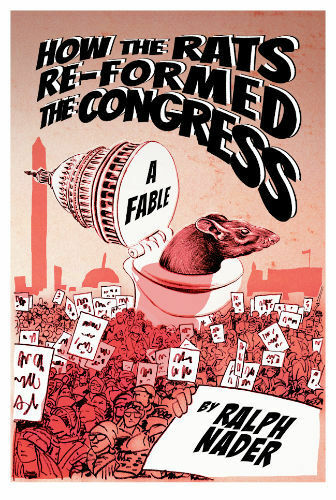 An exciting fable, How the Rats Re-formed the Congress by Ralph Nader shows the specific steps WE THE PEOPLE can take to control Congress, our smallest, yet most powerful, constitutional branch of government. IT’S EASIER THAN WE THINK. Here is WHY we must stand up and bring forth a new America, a just and safe society. • Congressional majorities repeatedly empower corporate lobbyists who are hurting consumers, workers, patients, the very poor and defenseless communities; Lives, income, and savings are lost! • Congress itself is a concentrated tyranny of self-privilege, secrecy, exclusionary rules and practices, avoiding key public hearings, abandoning oversight of the executive branch and shutting out citizens except campaign donors. Ralph Nader is one of America’s most effective social critics. His analyses and advocacy have enhanced public awareness and increased government and corporate accountability. His example has inspired a whole generation of consumer advocates, citizen activists, and public interest lawyers. He first made headlines as a young lawyer in 1965 with his book Unsafe at Any Speed, which led to congressional hearings and the passage of a series of life-saving automobile safety laws in 1966.